Organic. Fairtrade. Rainforest Alliance Certified - 50% certified coffee. Strength - It will kick you this hard - 5. Espresso beans complex. For those who want it all. Carried from seasonal producers. With tastes of soft fruits & dark chocolate. This bag is full of whole coffee beans.About this Coffee Can't decide right? Rich and smooth, or fruity and bright? Well, Let the mule indulge you. Cappuccino, latte or espresso shot, this one's designed to stop your dithering and get you what you really want. Courtesy of organic smallholdings from across the globe, the Landscape Espresso is slow roasted in a way that keeps that dark chocolate, caramel depth, while letting fresh soft fruit flavours bring the noise. The Mule Rules (A Quick Brewing Guide) 1. 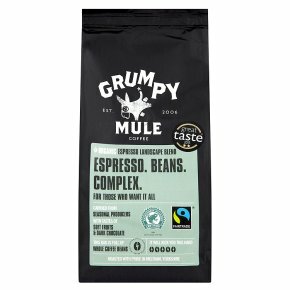 Choose your weapon Grumpy Mule coffees are suitable for use in a wide range of brewing equipment. For espresso machines, finely grind your beans for best results. 2. Load Up Use 2 heaped dessertspoonfuls (those big ones your mum only had out for special occasions) of fresh, ground coffee per cup. If you want to be a nerd about it that's 15g per 250ml of coffee. Espresso-heads, a good extraction time for our coffee is about 27 seconds per shot. Just don't count mississipily (watch Friends, it'll make sense). 3. Fire! Allow heated water to come off the boil (about 93-95º) before pouring. It's just enough time to tweet a pic of the pack at a jaunty angle. Serve the coffee immediately once brewed.